Baseball is filled with exciting plays. Sure, sometimes it's just the pitcher and the catcher tossing the ball back and forth, but when that ball goes into play, anything can happen. A diving stop from an infielder followed with a throw from the knees. A rip down the line and into the corner, the runner stretching a double into a triple. Reaching into the stands to snag a foul or take away a home run. The runner barreling down the line on a short fly to the outfield. The excitement is there each and every pitch, like a huge boulder at the top of the hill just waiting to get pushed forward a foot. For cardboard, to get a diving catch, you will need to go horizontal, and even them it seems part of the players body falls prey to the crop gods. 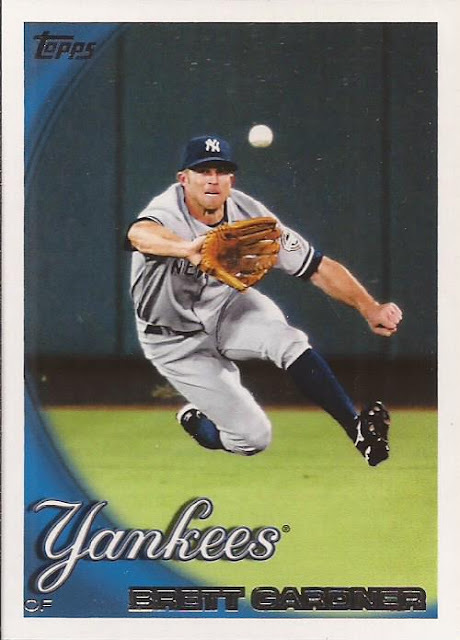 Brett Gardner, though, is nice and compact. Eyes on the ball, which pops out on the green wall. An exciting play, captured perfectly. 2010 Topps was not a great look, but they started doing a better job with the photography, with less posed and more action. Even this bad card design can't ruin a gorgeous image like this. Bob Mould is a musical genius. Whether with Hüsker Dü, Sugar or on his own, there had better be a call soon for him from Cleveland. There is so much out there you may not know was Bob Mould. Like this. I know you have heard of this. "Needle Hits E" is the lead song of the last Sugar album Besides, a play on words as the album is made up of B-sides to single releases. "Needle Hits E" was the B side of the song "Helpless" from their first studio album. And it straight jams. And there is still time to get your custom in. If you need time, let me know in the comments. I saw Bob mould in mpls about 10 years ago and he was great. He played songs from his solo catalogue as well as from his husker du and sugar days. Not sure what I like more... that card or the song. Since Gardner is featured with the Yankees... I'll go with the song... but it's damn close. I watched a pretty cool documentary/concert that featured Bob Mould and Dave Grohl.